After Tucson: Why Are the Mentally Ill Still Bearing Arms? On Sunday evening, the crime scene still bore telltale signs. Stores remained shuttered in the La Toscana shopping center where six people were killed and 14 others wounded in a gunman's rampage the day before. The parking lot was ribboned with yellow tape, its entrances blocked by police cars standing sentry. But just a few blocks away, a community was beginning to mend itself. As Representative Gabrielle Giffords lay in critical condition at a Tucson hospital Sunday night, perhaps 200 mourners massed on the stone patio of a Presbyterian church, an outdoor space aptly named the Gathering Place. They held aloft flickering candles, bowed their heads as they recited the names of the fallen and bundled themselves against the winter chill. As the setting sun bathed the nearby mountains with a red glow, they sang hymns and prayed  for compassion and understanding, civility and a return to respectful discourse. "We gather," said one of the leaders of the service, "fearful of what we are becoming." The purpose of the vigil, some said, was simple. "We're all grieving. It's good to come together to support each other," says Will DeBoer, who lives nearby. His wife Linda tries to summon a measure of optimism. "Maybe, on the positive side, people will see that some of these political things have gone too far," she says. Her sentiments echoed those expressed by grieving locals at vigils held throughout the weekend, as this Arizona city of some 500,000 grappled with the loss of neighbors, the stigma of bloodshed and an assailant whose motives they could not explain. Early Sunday morning, residents trickled over to Giffords' district office, located in a drab building by a bus stop piled that day with empty Domino's Pizza boxes. 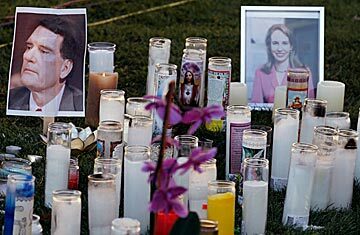 In front of a sign bearing Giffords' name, a makeshift memorial had sprouted: tidy bouquets of roses and lilies, votive candles arrayed into a peace sign, an Indian headdress, a statue of the Virgin Mary, and all manner of hand-scrawled signs. Most of the messages urged peace, from "Pray for Everyone in Todays Tragedy/Violence Solves Nothing" to "Gabby My Hero/Another Selfless Fight." Others warned against politicizing the tragedy. "Don't Make This About Politics. Republicans and Democrats Deplore This Kind of Hatred and Violence," read one. "We always gravitate to us vs. them. Let's find a way to find common ground or agree to disagree," says Jenna Marvin, a Tucson librarian who laid a bouquet of white daisies and a card that read "Peace" at Giffords' memorial. "It's not about Republicans, it's not about Democrats, it's not about what religion or faith you are." Adds Marvin: "I hope this is a wake-up call for this country." For some, however, talk slid to what triggered the tragedy. Had the endless waves of political vitriol created a culture in which a troubled youth like the suspect Jared Lee Loughner was more likely to snap? On Sunday, the 22-year-old Tucson resident was charged in federal court with two counts of federal murder and three counts of attempted murder of a federal employee. (More charges against Loughner are expected in state court.) "We need to back down on the rhetoric," says Dominic Owen, 55, a Tucson native who works at Walmart and dropped off a teddy bear at the site of the vigil. Owen says he is a fan of Sarah Palin, but he was upset that the former Alaska governor had included Giffords on a map denoting congressional-race targets in crosshairs that resembled the sight of a gun scope. "That's like saying, subliminally, 'If she gets taken out, it's better for me,'" he says. "You get some guy who's totally nuts and he looks at that and says, 'This is somebody for me to pick off.'" Outside the church that evening, mourners made veiled references to political divisions and incendiary rhetoric, but refrained  at least publicly  from assigning blame. They spoke of trying to forgive the shooter, of receiving well-wishes from friends and family in Austria and Australia and China, and of beginning the healing process. And they did something that seemed unusual: they listened quietly and respectfully as members of the community spoke their piece. After the reverend finished his prayers, he invited members of the crowd to share their own. "Let us become not a mecca of destruction but of beauty and harmony," said one woman. And on it went. When they were done, many in the crowd postponed the trip home to seek out their neighbors, shake hands and share a quiet word. Several came up to me  a stranger scribbling notes and intruding on their grief  to wish me peace. Read "Inside a Mass Murderer's Mind." Read about the link between marijuana and schizophrenia.